When you think of wrought iron production you might picture a ye olde blacksmith shoving a length of iron into an open fire full of hot coals, pulling it out and banging it with a big, heavy hammer. You might think we’ve come a long way since then. You might think modern wrought iron production is carried out using high-end technology in state of the art factories. While some steps of the process are now assisted by new technologies, the time-honoured craft of producing beautiful and strong wrought iron gates, fences, furniture and more still holds true to its historical roots. Wrought iron is iron that has been bent or shaped. Literally, ‘wrought’ means ‘worked’, so wrought iron is ‘worked iron’. It has a lower carbon content than either cast iron or ‘pig’ iron, making it less brittle and easier to work with. The low carbon content also makes wrought iron easier to weld. Wrought iron contains a necessary impurity called ‘slag’, though in lower quantities than cast iron. Wrought iron has around 250,000 ‘inclusions’ of slag per square inch. When the slag melts during the heating process it gives the wrought iron the sleek, glassy quality we expect from true wrought iron. Wrought iron has been produced since the Iron Age. It was commonly used in Roman times and it’s testament to its strength and durability that examples from thousands of years ago still exist for us to admire today. Until the late 1700s wrought iron production used the bloomery process. A bloomery looks a little like a large kiln, sometimes a pit or chimney, which can reach high temperatures inside. Bellows were used to force air in through the bottom of the bloomery. Fuelled by charcoal, it would melt, or ‘smelt’ the iron away from the ore to create pure iron. It was important to get the balance of charcoal and iron ore correct to ensure a low carbon content in the final iron product. If the iron absorbed too much carbon, cast iron would be the result – more brittle than wrought iron, it tends to break easily when bent into shape. Cast iron was frequently melted down and poured into moulds to create everyday items such as cooking pots and utensils. With the dawning of the industrial era in Britain, the push was on to find a way to mass produce this valuable commodity. By 1784 Henry Cort had succeeded in designing and patenting a process called ‘puddling’. Puddled iron was created by heating pig iron in a reverberating furnace, which separated the iron ore from the heating fuel and lessened the risk that too much carbon would be absorbed. Once in a molten state, the iron was stirred with a rabble arm or rod by the ‘puddler’, who extracted globs of wrought iron from the mix as he stirred. This more efficient method of wrought iron production resulted in a massive spike in production, with the United Kingdom producing over 4 million tonnes each year by the late 1800s. By 1900, technological advances saw steel production rise and become cheaper and stronger than iron. Wrought iron production decreased. Recognition of the beauty, strength and durability of wrought iron in recent years has seen a resurgence in the demand for wrought iron production of bespoke custom pieces. Here at Dean-Wilson Iron we’ve been kept increasingly busy over the past 20 years working with our customers to create custom designed wrought iron pieces, from fences and gates to balustrades and bedheads. Of course, we modern blacksmiths have more tools at our disposal than a simple anvil and hammer. Furnaces powered by electricity are available to heat the wrought iron, ready for bending. Powered hammering machines do much of the heavy pounding and electric welding can be used to bind the elements together. However, the intricate latticework characteristic of the most exquisite wrought iron production pieces is still done by hand. The sweat and labour of our master artisans goes into every skilful curl of our artistic designs. True wrought iron production is a specialist trade in the modern day, practised by a small number of specially trained blacksmiths. You will, however, come across cheap imitations. Products which are sold as ‘wrought iron’ may be simply ‘decorative wrought iron’ made with inferior materials, such as mild steel. Mild steel is often used as it is a cheaper material and is more easily welded. However, it is less pure and more susceptible to corrosion that wrought iron. Capitalising on the popularity of traditional intricate wrought iron designs, even aluminium products may be painted black and touted as ‘wrought iron’. Though it can be tempting to settle for cheaper alternatives, it’s important to consider the properties conferred using proper wrought iron production techniques – the timeless beauty that comes with the strength and quality of true wrought iron. 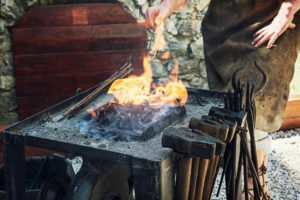 Here at Dean-Wilson Iron we’re keeping the craft of blacksmithing alive using traditional wrought iron production techniques. Since 1992 we’ve been lovingly hand forging bespoke iron artistry in Queensland. From the creation of wrought iron fences and gates for The Arch Dias Cathedral in Rockhampton to exquisite iron garden benches and indoor coffee tables, no job is too big or small. Our designs have won acclaim including a national trade award for blacksmithing, a HIA commendation and a Chamber of Commerce Small business award. Contact us online and our iron working experts will call you, or pick up the phone and give us a call on (07) 3814 0076 to find out how you can enjoy the beauty of our custom designed wrought iron.